I was in the 4th grade when we moved to Sprigg Street. My mother and father had divorced 4 years earlier. That is when some of the family, my mom, myself, and my younger brother (3 yrs younger than me), moved to Cape from Illinois. We first stayed with my grandmother for a couple of years. She lived on Cedar Lane (which I plan to write more about in a future post). Then we moved to a private drive off of Kingshighway, and eventually ended up moving to Sprigg when my mom and step-dad got married. When Mom, my younger brother(Mark), and I moved to Cape, my father(who I was very close to- I was a “daddy’s girl”) and older brother (Tim-7 yrs older than me) stayed in Illinois. My heart was so sad to be away from my dad and my big brother; but, you know, being a child of 5 when we all separated, I dealt with the sad feelings by going outside to play. And I played all day in the summer time. There was always some adventure or group of kids playing a game with which I could occupy myself. The new house at 1240 South Sprigg Street was situated on a business route where semi-trucks lumbered by pretty steadily day and night. Behind us about 2 blocks away was the railroad tracks where trains frequently came through Cape day and night. The trains also changed cars somewhere back there behind our house; the screeching and banging of those cars being removed or attached made my teeth hurt when we first moved there. But, eventually, I quit even noticing it. The same was true for the truck traffic in front of the house. There was other noise that I loved from the moment we moved there; it was the river noises of tug boats, barges, and even steamboats passing by heading south. My aunt worked on one of the big boats and would make sure that they honked their horn when they passed by our house. When I heard that horn, I shivered with pure joy. I would usually hear the boats early in the morning. I remember hearing from a distance the music of a calliope in the summertime. 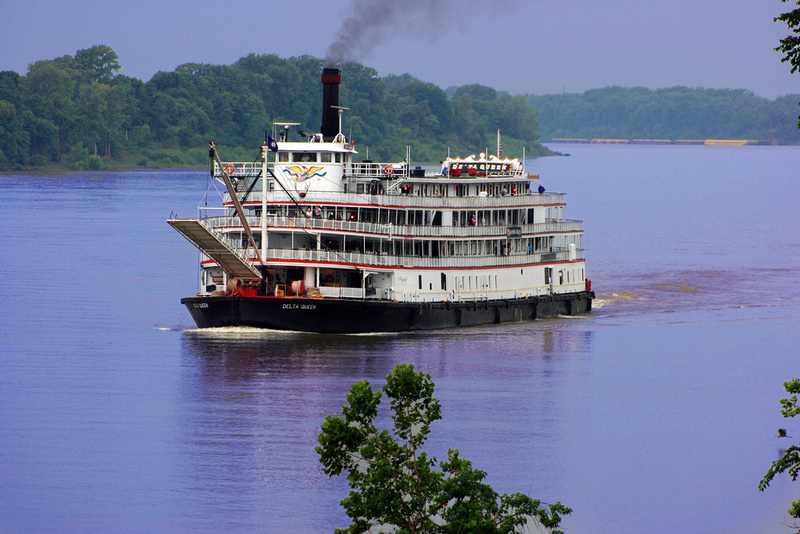 The Delta Queen and The Mississippi Queen would each visit for a number of days or a week every summer. They docked near the downtown area and people would flock there and pay to board the boat. I remember watching people walk up the walkway in their best clothes and being greeted by a man in uniform. There would be food and music and shows to enjoy on board the showboats, and dancing too, I think. I longed to go up that boardwalk and see what was happening on-board, but I never had that opportunity. When I would hear the calliope from my bedroom window I would imagine in my mind what it would be like to get on board one of those showboats. To this day, the noise of the boat horns honking is soothing to me, although there are no boats to hear where I live now. I sure do miss the boats and the river. I said all that to say that, to me, the first vivid memory of moving to 1240 South Sprigg Street was the constant noise, day and night, of the trucks, trains, and boats because we had come from such a quiet neighborhood. The noise took some getting used to; at first I couldn’t get to sleep at night but, eventually, those noises actually put me to sleep at night and when we left Sprigg and moved to a quiet neighborhood again, I couldn’t sleep because it was TOO QUIET! This entry was posted in Uncategorized and tagged Big Brother, Boat, Delta Queen, Illinois, Mississippi Queen, Mother, Neighbourhood, Noise, Stepfamily. Bookmark the permalink. Darla, I grew up in the Red Star area of Cape, close to the river and the train tracks. Those trains and boat whistles put me to sleep every night. How I miss the sounds of the boats. Isn’t it one of the most soothing sounds to hear those boats? I, too, miss the boats. I can sometimes hear train whistles where I live now in Lincoln, IL, but there are no rivers near here so no boat sounds. And I don’t live very near the train tracks either so I only hear a distant train whistle when the Amtrak comes through town. We are on the run between St Louis and Chicago.